Martin Creed (British, b. 1968), Work No. 1357, MOTHERS, 2012. White neon and steel. Courtesy of the artist and Govin Brown’s enterprise, New York. © Martin Creed. Author’s photograph. 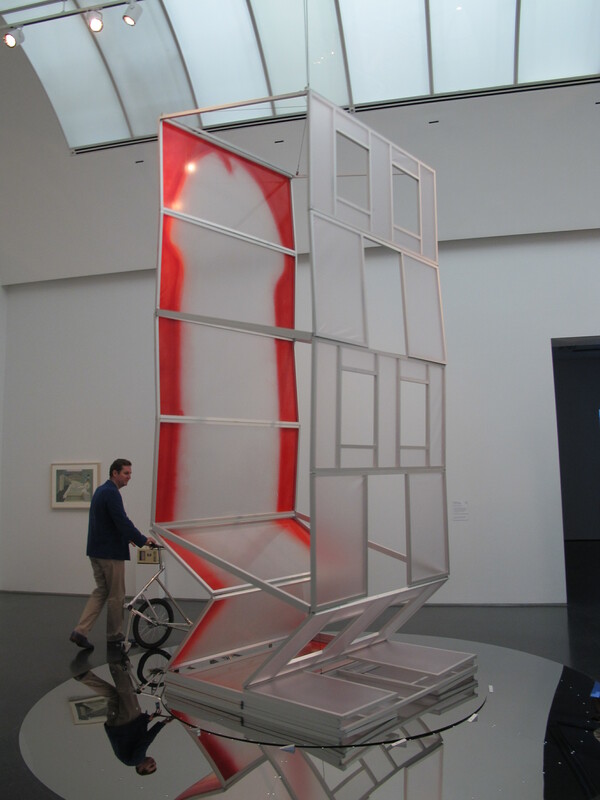 I began the day at the Museum of Contemporary Art (MCA) Chicago and attended a tour of the museum with the MCA’s James W. Alsdorf Chief Curator Michael Darling. 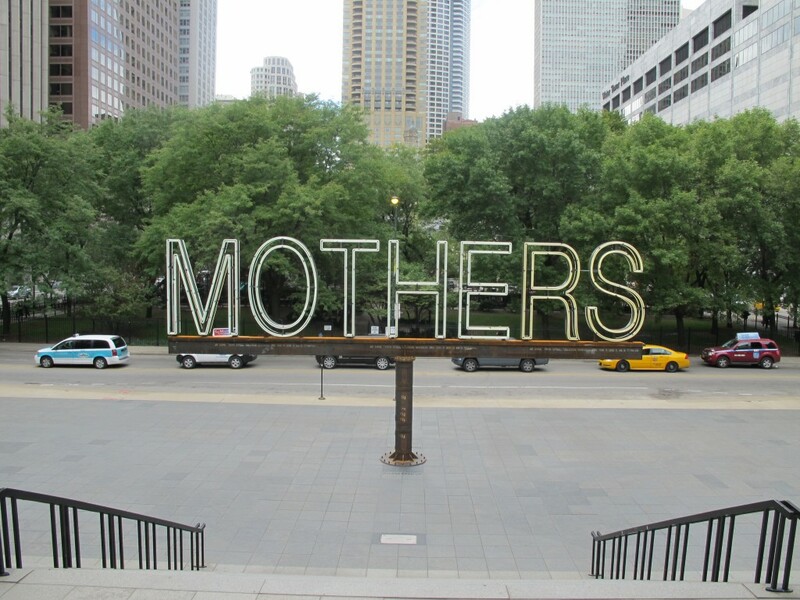 He began the tour with an introduction to Martin Creed’s imposing neon sculpture “MOTHERS” located just outside the Museum’s doorsteps, presented on the occasion of the artist’s yearlong residency project at the MCA, Martin Creed Plays Chicago. Moving on to the second floor of the Museum, I was treated to a viewing of the MCA’s exhibition Skyscraper: Art and Architecture Against Gravity (Jun. 30 – Sept. 20, 2012), a look at artists’ fascination with the skyscraper, artistically, physically, and psychologically. While there were many interesting works in the exhibition, one of the most memorable pieces from the tour was Vito Acconci’s hand-operated High Rise, a tribute to both mankind’s built achievement as well as a cheeky play on the skyscraper’s phallic associations. Another was Jan Tichy’s Installation No. 4, a minimalist miniature paper sculpture of an office building placed in a darkened room with a precisely calibrated video animation projected onto the wall right behind it, creating an effect whereby one caught fleeting glimpses of the building in use on a regular workday. Other works of note in the exhibition were photographs by Michael Wolf and Ziad Antar, painting by Enoc Perez, and a large dangling collapsed fire escape sculpture by Polish artist Monika Sosnowska, to name only a few. Vito Acconci (American, b. 1940), High Rise, 1980/2012. Aluminum, wood, plastic, rope, and pulleys. Re-created by Acconci Studio and John Tagiuri. Courtesy of Acconci Studio, New York. © Vito Acconci. Shown here operated by MCA Chief Curator Michael Darling. Author’s photographs. Jan Tichy (Czech, b. 1974), Installation No. 4, 2007. 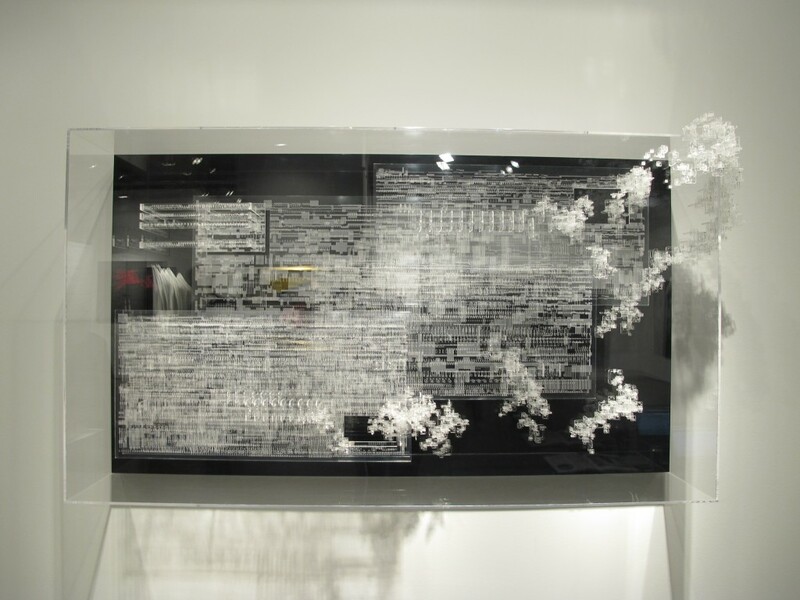 250 gram white paper and digital video projection. Video projection: 9-minute loop. © Jan Tichy. Author’s photograph. From the MCA I made my way to Navy Pier, excited to experience the inaugural edition of Expo Chicago. After entering the massive exhibition hall, I explored row after row of gallery booths, showcasing a broad range of works of all media; their sheer numbers overwhelming. 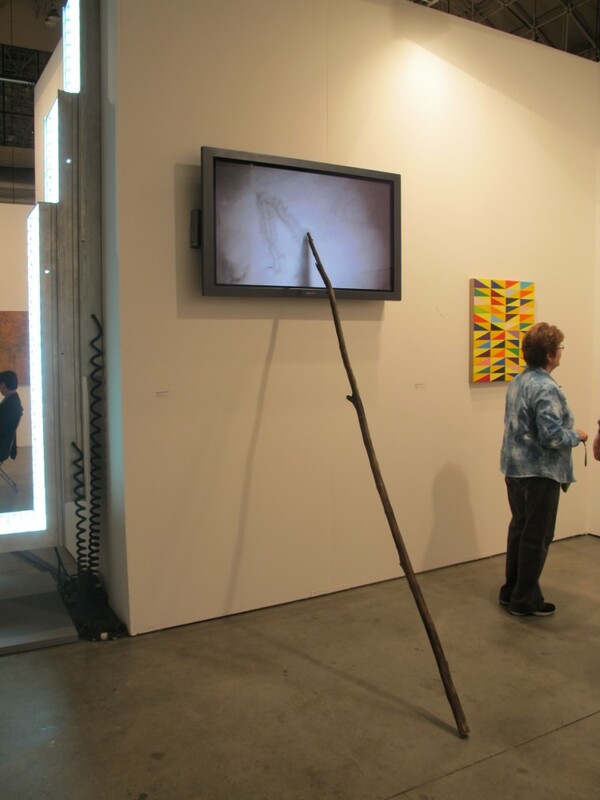 Some memorable works on display in Chicago-based galleries include Siebren Versteeg’s Prop at Rhona Hoffman Gallery, where a large wooden pole was “propped” up against a plasma screen, with a video of words being written in the sand as though written by the propped pole itself, and the incredibly delicate sculptural works of Gustavo Diaz, featured by The Mission. 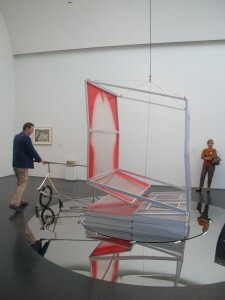 Siebren Versteeg, Prop, 2009. Video on DVD, wood stick, plasma screen. Rhona Hoffman Gallery. © Siebren Versteeg. Author’s photograph. Gustavo Diaz, Estrato de estabilidad vulnerado por un bucle extrano con cuadraditos Godel, 2011-2012. Cut and engraved acrylic, 3 1/3 x 6 x 1 ½ inches. The Mission. © Gustavo Diaz. Author’s photograph. Many of the galleries featured works by well-known artists such as John Cage, Nam June Paik, Alfredo Jaar and Kehinde Wiley. 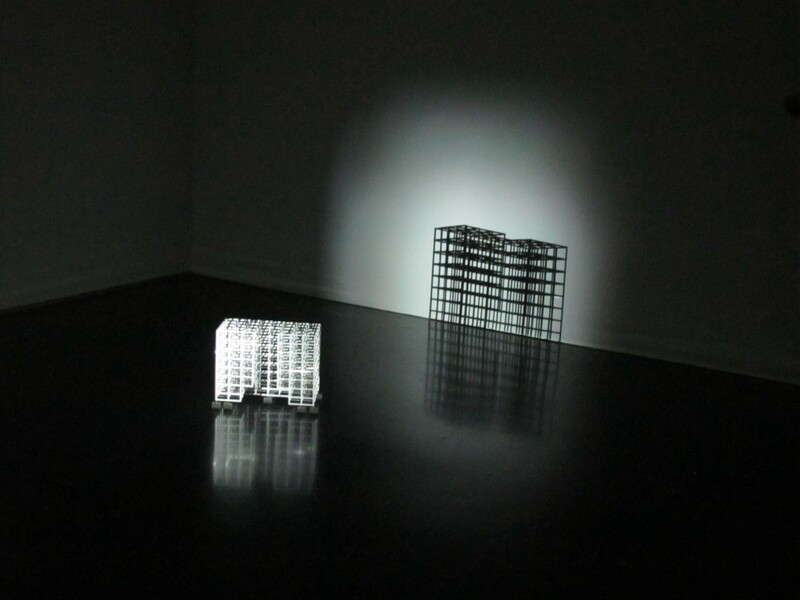 Maya Lin’s small sculpture of Lake Erie, made of recycled metal, quietly graced the wall of Pace Gallery, and Brian Bress’ hi-definition video pieces in L.A.’s Cherry and Martin gallery were vibrantly mesmerizing. 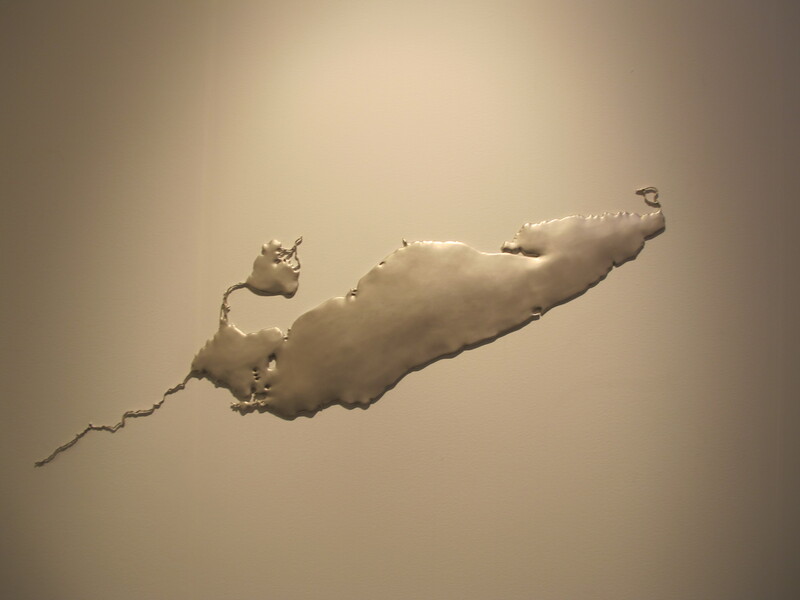 Maya Lin, Silver Erie, 2012. Pace Gallery. © Maya Lin. Author’s photograph. 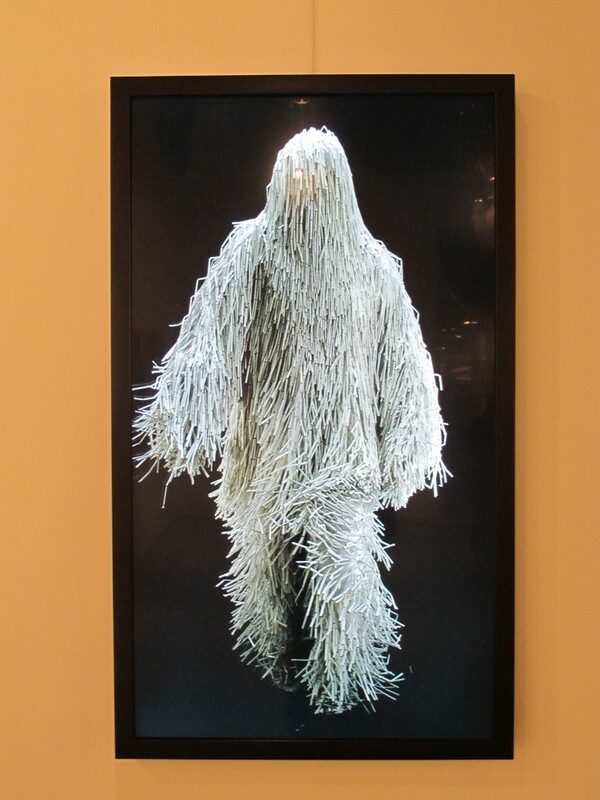 Brian Bress, Whitewalker 1, 2012. High definition single-channel video (color), high definition monitor and player, wall mount, framed, 60 x 35 x 4 inches. 9 min. 18 sec. loop. Cherry and Martin. © Brian Bress. Author’s photograph. After wandering the fair for hours that afternoon, I exited the doors of the exhibition hall and was greeted with a stunning view of Chicago’s iconic skyline at nightfall, my day having swung full circle. Thank you Expo Chicago for the eye candy; I look forward to seeing you again next year!